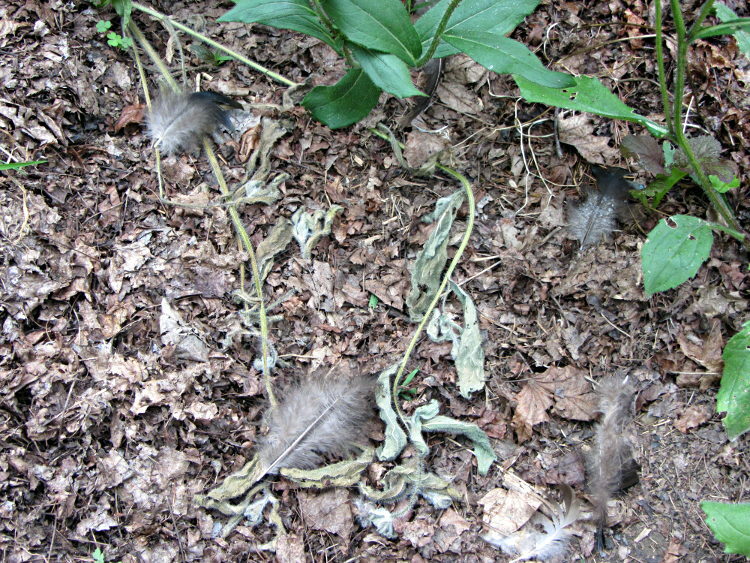 Mary found turkey feathers drifting across the garden, with the largest concentration near this assortment, much along the lines of the pile left at our back door. Given the 6 ft deer fence surrounding the garden and the complete absence of yummy debris, we think this wasn’t the work of a land-based predator. Along those lines, once upon a time, long ago and far away, we attended a show-n-tell featuring a (rescued) California Condor. The exhibitors ushered us into a tight group and told parents to keep their small children close beside them, because condors attack stray animals and pay particular attention to infants of herd animals. Of course, one couple didn’t get the word (or didn’t think it applied to them) and let their toddler wander off. As soon as the kid got a few feet away from the pack of people, the inert condor abruptly powered up and got weapons lock on the kid; a warning from the exhibitor sent the parents scurrying to correct collect their blunder. Raptors are not friendly birds.